The Santa Fe is small but mighty, it only comes one way and that is hard loaded with every option available. That's right; a fully self contained cooking machine that is ready to slow smoke, barbecue, grill, boil or fry. With the Santa Fe there are no limits from family gatherings, tailgating, team parties, fundraisers, well you dream it and the Santa Fe will deliver the food. Just move it into place, drop the jack, open the sliding table, build your fire and start cooking. 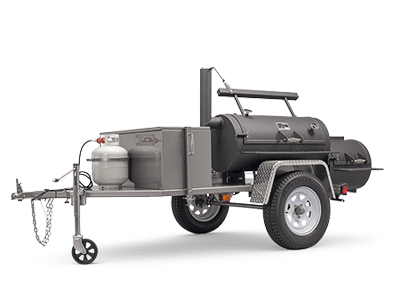 With over 1,600 square-inches of cooking surface (firebox grill grate and sliding top shelf are standard), large wood/storage box, large sliding prep and serving table, optional single or double 60,000-BTU burners and LP system with tank; this is truly a mobile cooking machine.